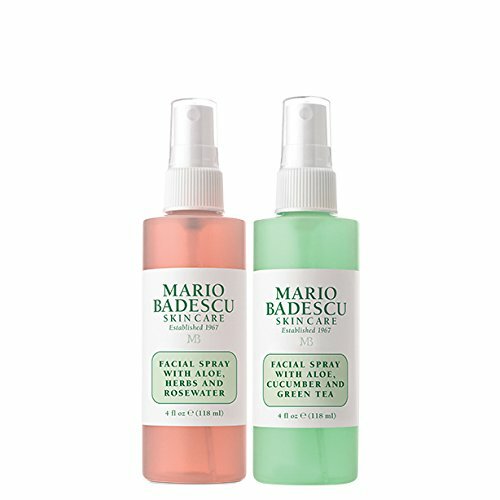 Mario Badescu Facial Spray with Aloe, Herbs & Rosewater Duo, 2 oz. & 4 oz. 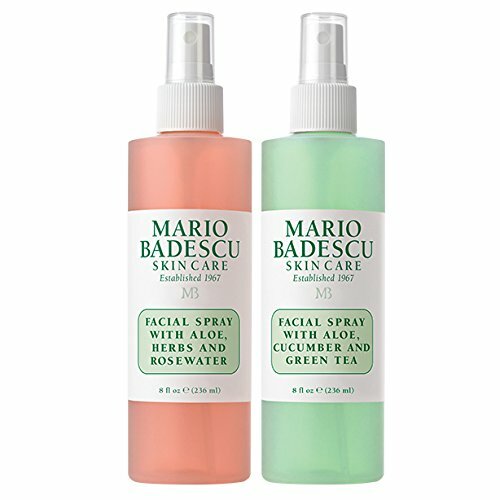 Mario Badescu Facial Spray with Rosewater & Facial Spray with Green Tea Duo, 8 oz. 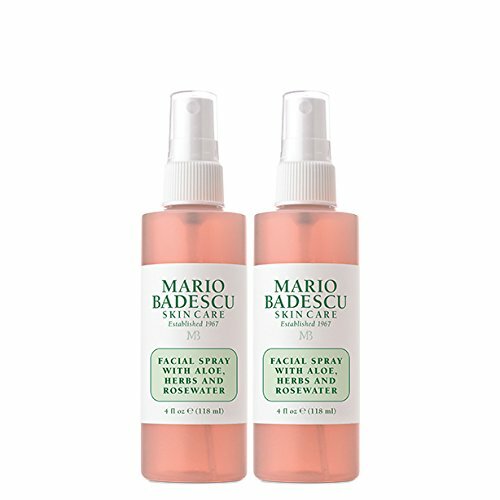 Mario Badescu Facial Spray with Aloe, Herbs & Rosewater Duo, 4 oz. This set includes (1) 4 Oz Bottle of Our Facial Spray with Aloe, Herbs and Rosewater and (1) 4 Oz Bottle of Our Facial Spray with Aloe, Cucumber & Green Tea. The Aloe Herbs & Rosewater is a refreshing, hydrating mist to use anywhere anytime. Simply formulated with fragrant herbal extracts and rosewater for a pleasant, pick me up for dehydrated, tight and uncomfortable skin. Spray your day and night creams for a boost of hydration or use it to set makeup or spray on dry hair throughout the day. Safe for all skin types. Gentle, non-irritating. The Aloe, Cucumber and Green Tea invigorates dull, tired skin with an infusion of Cucumber and Peppermint Essential Waters. This facial mist delivers a cooling boost of hydration as Green Tea provides powerful antioxidant protection leaving the skin feeling refreshed and revitalized. DMAE(dimethylaminoethanol) is a compound made from fruit acid and is known to penetrate easily into the skin, providing instant tightening and increased elasticity, reducing the appearance of fine lines and wrinkles. It also has anti-inflammatory properties. Fine mist, won't disturb makeup. 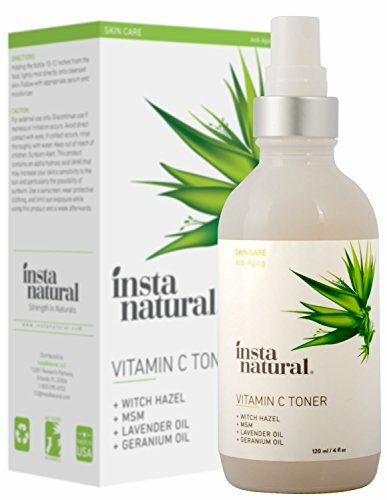 InstaNatural s Pore Tightening Vitamin C Facial Toner is an all-in-one hydrator infused with anti-aging ingredients to leave your skin feeling refreshed and balanced with each pump of its formula. Vitamin C in the mist helps renew skin by neutralizing free radicals and UV-related damage to protect and strengthen the skin. Witch Hazel s astringent properties purify oily skin and tighten pores, all while the sulfur works synergistically with other ingredients to increase skin elasticity. With each spray, your face is restored to natural pH levels and is in prime condition to absorb serums and moisturizers effectively. Includes (1) 2 Ounce and (1) 4 Ounce Bottle of Our Facial Spray with Aloe, Herbs & Rosewater. 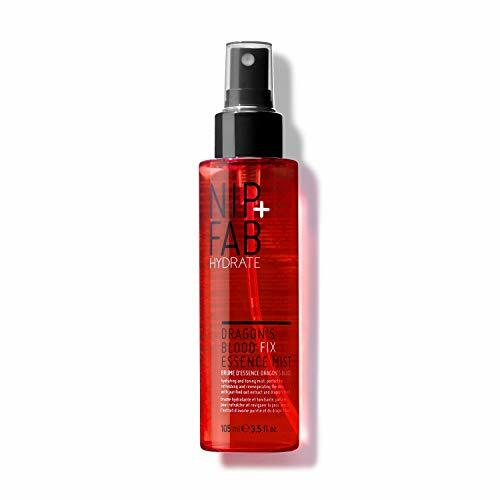 A refreshing, hydrating mist to use anywhere anytime. Simply formulated with fragrant herbal extracts and rosewater for a pleasant, pick me up for dehydrated, tight and uncomfortable skin. Spray your day and night creams for a boost of hydration or use it to set makeup or spray on dry hair throughout the day. Safe for all skin types. Gentle, non-irritating. A refreshing, hydrating mist to use anywhere anytime. Simply formulated with fragrant herbal extracts and rosewater for a pleasant, pick me up for dehydrated, tight and uncomfortable skin. Mist on face, neck and hair as needed. Will not disturb makeup. This set includes (1) 8 Oz Bottle of Our Facial Spray with Aloe, Herbs and Rosewater and (1) 8 Oz Bottle of Our Facial Spray with Aloe, Cucumber & Green Tea. The Aloe Herbs & Rosewater is a refreshing, hydrating mist to use anywhere anytime. Simply formulated with fragrant herbal extracts and rosewater for a pleasant, pick me up for dehydrated, tight and uncomfortable skin. Spray your day and night creams for a boost of hydration or use it to set makeup or spray on dry hair throughout the day. Safe for all skin types. Gentle, non-irritating. The Aloe, Cucumber and Green Tea invigorates dull, tired skin with an infusion of Cucumber and Peppermint Essential Waters. This facial mist delivers a cooling boost of hydration as Green Tea provides powerful antioxidant protection leaving the skin feeling refreshed and revitalized. Includes (2) 4 Oz Bottles of Our Facial Spray with Aloe, Herbs & Rosewater. A refreshing, hydrating mist to use anywhere anytime. Simply formulated with fragrant herbal extracts and rosewater for a pleasant, pick me up for dehydrated, tight and uncomfortable skin. Spray your day and night creams for a boost of hydration or use it to set makeup or spray on dry hair throughout the day. Safe for all skin types. Gentle, non-irritating. Rose Water serves as a skin refresher as well as soothing aromatherapy. This mild astringent tightens pores, gently tones and balances pH levels. Spritz on your face for a revitalizing pick-me-up! Reduce dandruff and stimulate hair growth by applying to scalp. Rose Water replenishes lost moisture for smoother, shinier and healthier hair! Rejuvenating, calming and hydrating. Use Rose Water as a makeup finishing spray, natural makeup remover & anti-inflammatory skin toner. 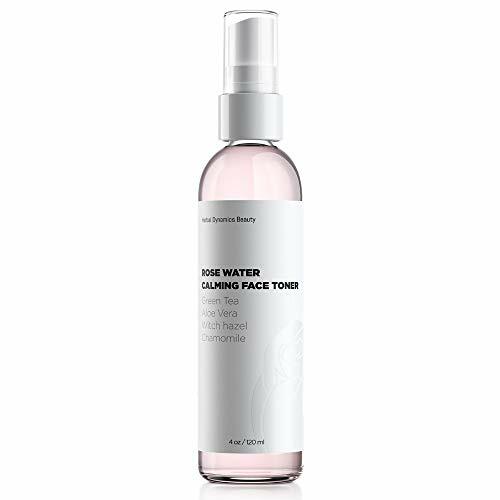 Made with Rose Water, this facial mist spray instantly hydrates and refreshes skin, even after makeup. 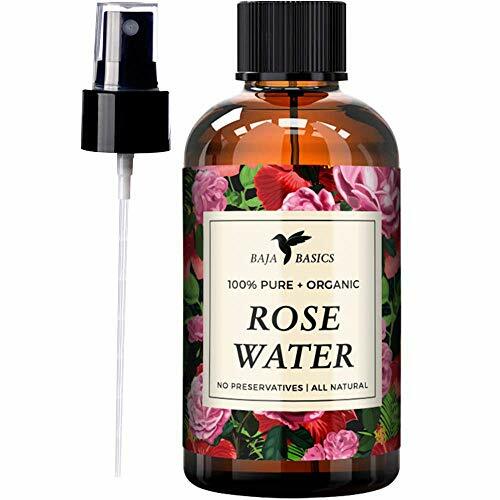 This face spray with rose water can be used as a moisturizer to hydrate, before face makeup as a primer, after makeup to set it, and anytime throughout the day to refresh skin. No need to rinse. This face mist is suitable for all skin types, even sensitive skin. A facial mist spray with rose water formulated for sensitive skin, made with 99 percent naturally-derived ingredients This face spray with rose water has a vegan formula and it's made without parabens, dyes, silicones or sulfates Try this refreshing facial mist that will instantly hydrate and leave your skin soothed and refreshed after just one use No rinsing is required after using this gentle face spray with rose water and you can even apply this hydrating mist after makeup This facial mist with rose water can be used as a moisturizer to hydrate, before makeup as a primer and anytime throughout the day to instantly refresh and re-energize skin for a dewy glow What does naturally-derived mean? We consider an ingredient to be naturally-derived if it is unchanged from its natural state or has undergone processing yet still retains greater than 50% of its molecular structure from its original natural source. This formula consists of 96% naturally derived ingredients. The remaining ingredients constitute 4% of the formula to ensure its sensoriality and preservation. Introducing a skincare line from Garnier SkinActive formulated with 96% Naturally-Derived Ingredients. This line of moisturizers, cleansers and facial mist products are paraben-free, silicone-free, dye-free and sulfate-free. Soothe, purify and refresh your skin with skincare products formulated with rose water, green tea and aloe juice. The rose water line instantly soothes and comforts skin while gently cleansing and hydrating. This line features a 3-in-1 face moisturizer, a facial mist with rose water and a milk face wash with rose water. The green tea line instantly purifies pores and mattifies skin. This line features a 3-in-1 moisturizer, a deep pore exfoliating face scrub and a deep pore face wash. The aloe juice line instantly refreshes skin. This line features a hydrating 3-in-1 face moisturizer, a cream face wash and a gel cleanser. Mist, in one continuous press, 12-15 inches from the face with eyes and mouth shut whenever skin needs a pick me up or a boost of hydration. HD Beauty Rose Water Calming Face Toner and Mist with Green Tea, Aloe and Hyaluronic Acid for Hydration, Toning and Priming, 4 oz. Soothe and calm skin with rose, green tea, chamomile, and witch hazel. Aloe and hyaluronic acid deliver instant hydration for a fresh, youthful appearance. Rose oil helps improve effectiveness of beauty and skincare treatments by increasing permeability, making this toner perfect for use prior to serums and moisturizers in your routine. Benefits: Calming + Soothing Hydrating + Smoothing Anti-aging + Antioxidants Refreshes + Nourishes Inside HD Beauty Rose Water Calming Face Toner: Organic Aloe Vera Nourishes with a wealth of vitamins and minerals. Heals and soothes sensitive skin. Provides non-greasy moisture and deep hydration suitable for all skin types. Rose Essential Oil Toning and antiseptic - helps soothe, heal and reduce blemishes. Reduces redness and inflammation. Hydrates and smooths skin for a more youthful appearance. Relaxing aromatherapy benefits. Organic Green Tea Extract Contains high levels of antioxidants and polyphenols. Helps fight oxidizing environmental stressors and signs of aging. Protective, healing and anti-inflammatory. Organic Chamomile Extract Soothes and reduces irritation, making it ideal for sensitive skin. Helps calm inflammation and redness. Promotes healing and healthy-looking skin. Organic Witch Hazel Shrinks blood vessels and tightens pores, aids healing, and soothes irritation. Gently balances sebum production. Antibacterial and antispectic properties target breakouts, blackheads and blemishes. Not drying or damaging like alcohol. Hyaluronic Acid Plumps skin cells and gives a firm, youthful appearance. Delivers deep, lasting hydration. SOOTHE AND CALM with gentle extracts of Rose and Chamomile. HYDRATE with Organic Aloe Vera and Hyaluronic Acid. TONE AND CLARIFY with Witch Hazel and Green Tea extracts. BOOST SKIN day and night with this gentle face mist. Use as a toner, facial mist, and makeup primer. FREE OF parabens, phthalates, sulfates, synthetic fragrance and animal testing. 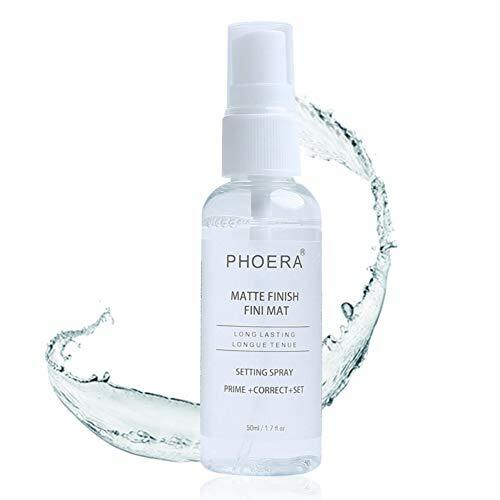 Made in the U.S.A.
Mist for the face with ceramides intensely saturates the cells with moisture, normalizes the hydrobalance, eliminates dryness, tightness and peeling of the skin. Use the spray throughout the day to protect the skin from drying. With acidity of pH 5.5, the product maintains the optimal level of moisture in the skin, preserves a healthy protective barrier. Does not contain artificial colors, artificial flavors, mineral oil, triethanolamine, talc, petrolatum, benzophenone. Directions: Spray an appropriate amount on the face from a 20 cm distance and let it absorb into the skin. 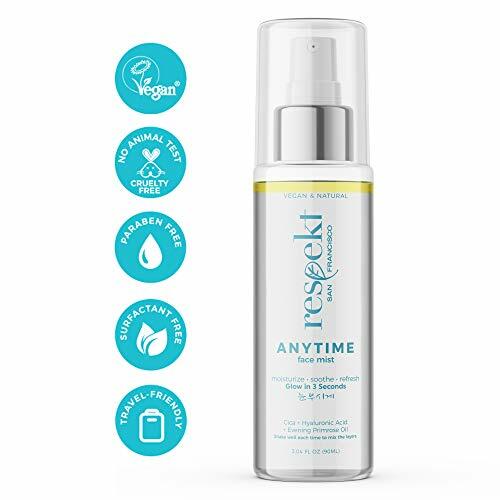 Respekt Anytime Face Mist is designed and formulated to help people to easily achieve optimum hydration and protection for their skin throughout the day. Increased skin hydration level helps with repairing and supporting the skin barrier and which can lead to ease wrinkles, fine lines and less visible pores. Dry, dull, flaky skin and tired looking complexion can greatly benefit from this golden formula of Cica, Evening Primrose Oil, Hyaluronic Acid, Rosemary Leaf Extract, Sunflower Seed Oil, Wheat Germ Oil and more natural ingredients. The ingredients are full of antioxidants such as Vitamin C, E, beta carotene that protects our skin from free radicals and help brighten up, regenerate new, plump skin cells while repairing age-related damage to skin such as loss of elasticity. Respekt Anytime Face Mist can also be used to prevent premature skin aging and to banish dry, itchy skin. Having calming Cica as the key ingredient, it is suitable for sensitive skin. DIRECTIONS: Shake well before each use to mix the layers for optimum result. Close your eyes and spray onto your face and neck or other part of your skin whenever you need or feel like. Enjoy your beauty! MULTI-PURPOSE GO-TO FACE MIST - Constantly hydrates, calms, refreshes your skin. Fights signs of aging by fortifying skin barrier. Use any time of the day as toner, moisture boost or midday pick-me-up! Great for cooling down after outdoor activities. GENTLE SOLUTION FOR DRY, SENSITIVE, DULL SKIN - Centella Asiatica(Cica) soothes and calms irritated skin and optimum amount is formulated in each spray. Antioxidants-packed ingredients efficiently hydrate and protect your skin and repair skin barrier. GLASSY SKIN, KEEP YOUR SKIN HYDRATED QUICK, EASY & EFFECTIVELY - Only 3 seconds is needed to boost up skin hydration and freshen up your look. No preparation, not even a mirror needed. Keep one at home, in your purse, at the office. Travel-friendly size. VEGAN, NATURAL, ORGANIC - No animal test, Cruelty-free. Made with ethically sourced organic and all natural ingredients. Botanical preservatives and natural scent. No Paraben. Non GMO. 0% Toxin. The brand Respekt is born in Korea. Developed in Silicon Valley. Made in Korea. Manufactured in a facility which complies with CGMP(Good Manufacturing Practices of Cosmetics) set by the ISO 22716:2007 standard. Brand: RESPEKT SAN FRANCISCO | Manufacturer: eewee production, Inc. Containing soothing Dragon's Blood and Oat Extract to plump and hydrate the skin for a luminous, moisturised complexion. Fix your makeup in place throughout the day with the NEW Dragon's Blood Fix Essence Mist. The ultimate skincare-prep for a moisturised, fresh complexion and flawless makeup application. Soothing and tightening effect on the skin reveals a radiant and plumed canvas. * Fixed hard makeup extra long for at least 24 hours, and waterproof and anti-function to keep your makeup lasting. * Effective moisturizing and oil control, replenishment moisture to keep refreshing. * Quickly penetrates into deep skin and also can protect fragile skin at the same time. * Long lasting matte finish. * Sets your makeup resisting unwanted color fade. * Safe and effective for all skin types. It is gentle and non-irritating. 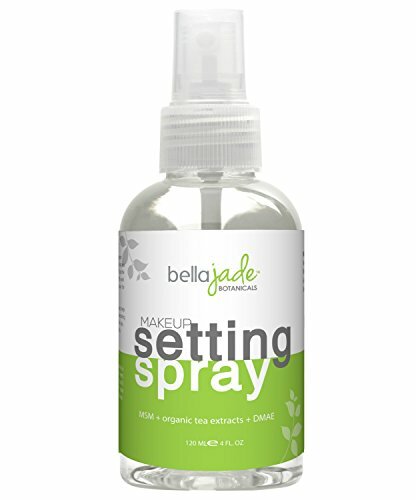 * Easy to use, evenly spray on the face, dry naturally or use a tissue to gently absorb excess water. After makeup, distance from the face about 20 cm to spray around your face evenly and gently caress until it is completely absorbed. Fixed hard makeup extra long for at least 24 hours, and waterproof and anti-function to keep your makeup lasting. Quickly penetrates into deep skin and also can protect fragile skin at the same time. Effective moisturizing and oil control, replenishment moisture to keep refreshing. Safe and effective for all skin types. It is gentle and non-irritating. Easy to use, evenly spray on the face, dry naturally or use a tissue to gently absorb excess water.